the mag... said updates on that "ratrod bmw" are on pbmw forum. thru your mag I read in a store near me. 1988 535is - Conforti chip, Eibach lowering springs with Bilstein Sports, Big swaybars with reinforced swaybar mounts, 760 bushings, M5 struts, Big front brakes from M5, Metric Mechanic lightened flywheel and Sachs clutch,Short shift kit, 3.25 LSD running Redline, Front stress bar, Hella Euro headlights. ABest521 wrote: thru your mag I read in a store near me. "IF IN DOUBT, DRIFT HER OUT"
Through the mag, been looking for ages and finally took the plunge. I saw the forum display at Santa Pod. steve325i wrote: I saw the forum display at Santa Pod. Googled something about BMWs and this forum came up! i was on performance bmw website, and found a link for the forum, so i joined, and havent regreted it! Custom signatures and avatars. 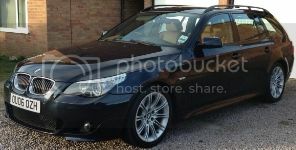 Exterior styling such as changing wheels, lowerd suspension, window tinting ect. Tidying up images, general image editing. Creating funny/stupid pictures, bebo skins, screen savers.......The list is endless, PM me with what you want!